Police are seeking the public’s help in locating several persons reported missing by family members. The first person is 13 – year old Dominique Carol Johnson of Farrington Road. Johnson is a medium brown female, slim build, about 5’ 2” to 5’ 4” in height. 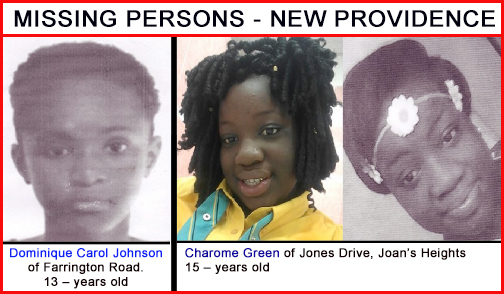 The second person is 15 – year old Charome Green of Jones Drive, Joan’s Heights. Green is a dark brown female, heavy build, about 5’ 2” to 5’ 4” in height. 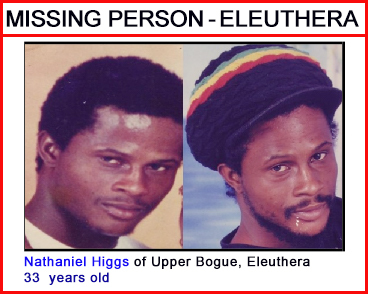 The third person is 33 – year old Nathaniel Higgs of Upper Bogue, Eleuthera. Higgs is a brown male, slim build, about 5’ 11” in height. 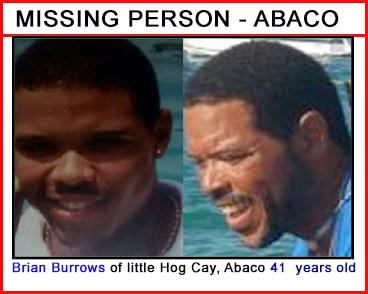 The fourth person is 41 – year old Brian Burrows of little Hog Cay, Abaco. Burrows is a light brown male, slim build, about 6’ 2” in height.